Helicopter flight is about to get very exciting in the next decade, with a cross-pollination ( if you could call it that) of functions that allow them greater performance without taking away their VTOL advantage. 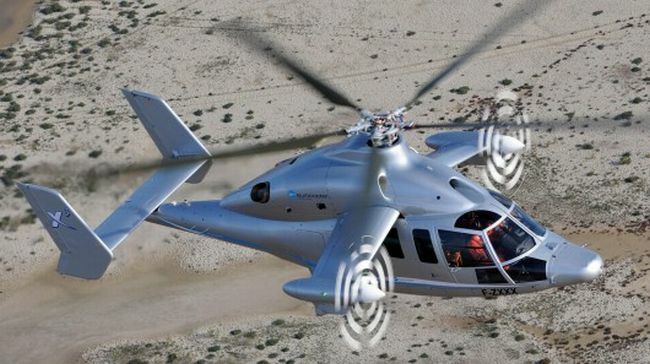 Judging by the photographic evidence above, Eurocopter have a shiny silvery new toy in the works and it performed well during its maiden test flight on September of this year. Problem is, the additional propellers on its wings may increase its speed, but the target 180 knots was missed by a hairline. A month later, a few tweaks resulted in optimum performance, with the Eurocopter X3 slicing through the air at 180 knots or 333 km/hr. The X3, which is expected to enter production in a couple of years, is being touted as a next-generation passenger transport and other benign roles as a Coast Guard workhorse. Helicopter enthusiasts with a sharp eye may note that the X3 is built around the design of the Dauphin helicopter, itself an export success that has a variant being license-built in China. But the X3 still has some large hurdles to overcome as the projected optimum cruise speed set at 220 knots. If it performs accordingly during the upcoming March 2011 test, then the Eurocopter belongs at a league of its own in terms of speed. Because of its revolutionary design, the X3 is also expected to become a military asset ideal for inserting commandos or search-and-rescue.